Want to enjoy DVD on your BlackBerry wherever you are? You are allowed to enjoy favorite DVD movies on BlackBerry by converting DVD to BlackBerry video with Bigasoft DVD to BlackBerry Converter. Would you like to watch all kinds of video files on BlackBerry on the go? 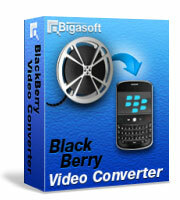 Bigasoft BlackBerry Video Converter helps you easily watch all movies on BlackBerry by encoding them to BlackBerry video. Only watch your favorite scenes of a DVD or movies? With the capability of trim and crop, you can rip or convert only the parts of the DVD or videos. Bored with the ringtones on your BlackBerry (BlackBerry Q10 included)? Making your unique BlackBerry ringtones gives you the opportunity to make ringtones that nobody else has. Not satisfied with the volume of your ringer? You can boost or lower the volume to any desired level as you will. Designed to enhance user experience, the smart BlackBerry software pack is simple and geared to increase productivity. Free download Bigasoft BlackBerry Software Pack, and enjoy your colorful BlackBerry life right now! Ready to try or buy Bigasoft BlackBerry Software Pack? 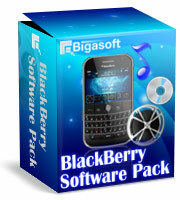 Bigasoft BlackBerry Software Pack, ultimate discount software for blackberry, includes Bigasoft DVD to BlackBerry Converter, Bigasoft BlackBerry Video Converter, and Bigasoft BlackBerry Ringtone Maker, which is compatible with all BlackBerry including BlackBerry Q10, BlackBerry Tour, BlackBerry Storm, BlackBerry Bold, BlackBerry Curve, BlackBerry Pearl, and so on. Now free download the BlackBerry software pack and enjoy your colorful BlackBerry right now! Easily convert DVD to BlackBerry video AVI, MP4, 3GP, WMV format with super fast speed and high quality to watch favorite DVD movies on BlackBerry. Convert almost all video formats including AVI, DIVX, MPEG, XVID, 3GP, FLV, WMV, MOV, VOB, RM, etc. to BlackBerry with excellent output quality by the powerful converter for BlackBerry. Decode or extract audio from DVD or video to BlackBerry audio MP3, AAC for hearing fantastic music only. 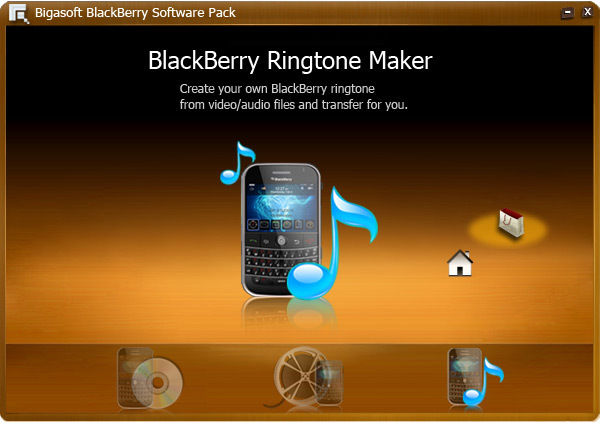 Create unique ringtone MP3 for BlackBerry from your own music library to regularly change BlackBerry ringtone to show your great taste. 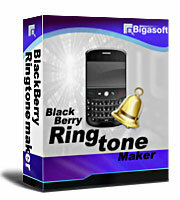 Boost or lower ringtone volume for hearing BlackBerry rings wherever you are. Customize the converted DVD or video according to your needs such as trimming, cropping and merging etc. All products in Bigasoft BlackBerry Software Pack are compatible with all types of BlackBerry including BlackBerry Q10, BlackBerry Tour, BlackBerry Storm, BlackBerry Bold, BlackBerry Curve, BlackBerry Pearl, and so on. It is compatible with all Windows including Windows 8, Windows 7, Windows XP, Windows Vista, and Windows 2000.